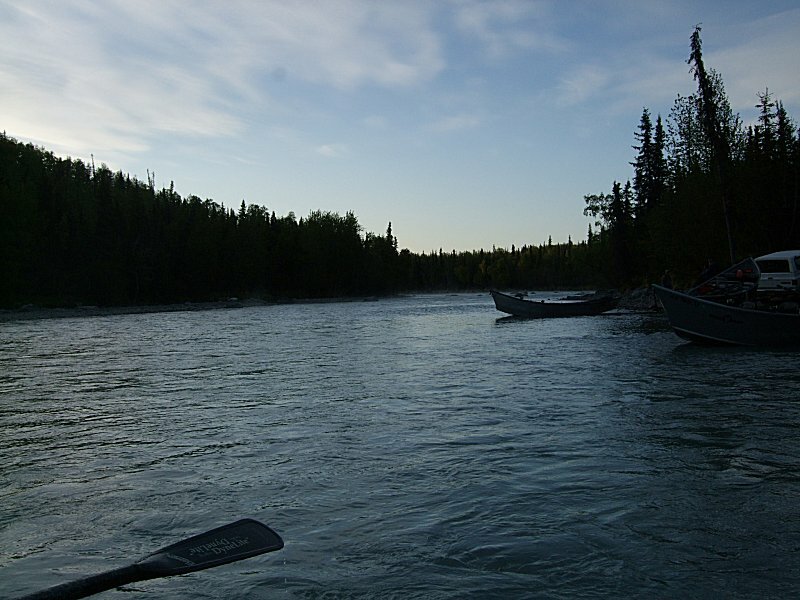 Tuesday was our day to drift the Kasilof River, which is about an hour or so south of TRL. After a good breakfast, picking up our cooler for the fish we hoped to catch and lunches, we headed out under overcast skies. Gawking at moose along the roadside and a bit of confusion delayed our arrival, and our guide wasn’t standing by his boat, but it was an amazing morning on the Kasilof River. The green of the water glowed while mist hugged the river surface. Soon we drifted for a bit then anchored while the guide rigged up our ten-and-a-half-foot rods. As with most king salmon fishing on the Kenai peninsula, Qwikfish lures were on the end of our lines as we back trolled. Our guide Greg was a great guy with whom to spend most of a day on a river. Even if you don’t catch fish. It was a tough day for fishing but I think all three of us were amazed at the size of the fish being caught around us, the constant appearance of bald eagles, and the simple fact that we were in Alaska. During our drift we learned the Greg guides in Patagonia and on the Rogue River. We talked about enticing a salmon to bite and how to hook and play a fish. Mid-morning I was lucky enough to hook something seemed relatively small, but my hookset must have been weak as my line went slack and the lure came to the surface alone. On one bend of the river we watched a fly fisherman battle with a salmon for at least fifteen minutes. After dancing down the short with his rod doubled over, he landed what was probably a twenty-pound king. Never having fished from a drift boat, it was an experience for all of us. Greg even kept us on the water a couple hours longer than usual, hoping to get one of us into a fish. Hooking a king wasn’t in the cards but it was a great day on the water. Some of sting of a fishless day was softened by the fact that we could return to the lodge, have dinner served and be regaled of others’ tales of their fishing adventure. Dave, his wife, Mom and Bob had a great day on the Keani River, with each landed a keeper king. Seeing those amazing fish, all twenty-five to thirty-plus pounds, made the prospect of hooking one even more exciting. As one might expect, dinner was a wonderful salmon and after-dinner conversation was just as enjoyable. But being out-of-door takes a lot out of a person and by nine-thirty that evening we welcoming a visit from the sandman. Dad, just happy to be there. Mark, bundled up a bit. Young bald eagles spotted from the Kasilof. Moose beginning to cross the Kasilof during the commute hour. Watching the rod on the Kasilof. More fish that weren’t ours. Dad and Mark pondering life.